With so many places to visit there are so many things to do in Australia. However, to make your trip as memorable as possible, we recommend that the following ten things are a must-do to make you have the Australian trip of a lifetime. Sydney Harbour Bridge (known locally as the “coathanger”) is the place to go if you have a head for heights and want to take in a view of Sydney harbour like no other. Take the opportunity to climb the bridge through its many ladders and stairs and arrive 134 metres above the harbour. Then be part of one of the world’s most photographed landmarks, take some photographs yourself and be ready to recount this amazing story of your climb to friends and family. Described as a masterpiece of late modern architecture, the Opera House in Sydney is one of the most iconic images associated to Australia. 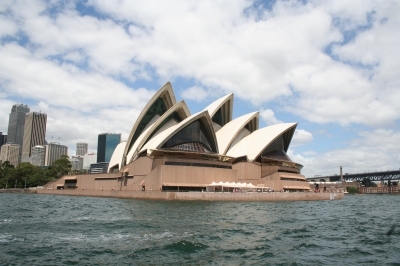 The building compliments its location in Sydney Harbour and adds to the magic and ambience of this area. Take a walk around the building to gain an impression of its magnificent structure and grandeur and if you want to see more, take a tour of the Opera House to learn more about its history. Tick off one of the Seven Wonders of the World by visiting the Great Barrier Reef when you go to Cairns. This breath-taking coral reef is a must be explored and there is no better way to view its splendour than by scuba diving in the area. You should definitely take a day trip here but it is recommended that you stay longer to truly experience this memorable location. And if you want to view the reef in style and money is no object, then why not take a scenic flight over the reef and take some photographs from other perspective. Fitzroy Island can be accessed from Cairns on a ferry which takes about 45 minutes. This island also has a reef (that makes up part of the Great Barrier Reef) which can be explored by scuba divers. The island is also a National Park Island and therefore there is so much more to experience, such as woodland, tropical rainforest as well as many walking trails where you can hike to see some of the islands wildlife including native Australian birds and green sea turtles. Fitzroy Island is a must for all nature lovers! Melbourne Aquarium is the place to go to if you want to get up close and personal with Australian marine life. You can learn all about the different marine wildlife that live in Australia and see some new and exciting species. There are also so many different activities on offer for everyone including an ‘access all areas tour’ where you can see how the aquarium works and is run. And for shark fans you can dive with the sharks and go face to face with one of the most feared predators of the sea. There is no better way to take in some art and culture on your travels than to visit the National Gallery Victoria in Melbourne. This gallery is the oldest open to the public in Australia so it is worthwhile exploring. One of the best ways to learn about the gallery is to take a guided tour as this will ensure that you understand all about the collections and exhibitions being displayed. Why should you visit Scarborough Beach in Perth as opposed to any other beach in Australia? Well, this beach is famous for its white sand and all the activities that can be experienced during a visit including kite surfing, fishing, swimming and board boarding. There are a huge selection of cafes and bars on the beach and it is just a great place to hang out and meet people. It is also worthwhile watching the sunset here as the views are amazing. Fremantle is a port city located 30 minutes from Perth. This is the place to go if you want to people watch and take in a new atmosphere and environment. This is because Fremantle is home to a range of individuals from arty to alternative. Soak up the ambience in one of the many trendy bars and cafes and watch the many street entertainers and eclectic people walk by. You may have fed the fish at home in your pond and are wondering what the big deal is with feeding the fish in Darwin, but after visiting Aquascene in Darwin you will see why this is a whole new ball game! Head down at high tide and see the vast numbers of mullets as well as catfish and bream turn up to be fed by the locals. If you like shopping then visit Mindil Beach Market in Darwin. Take your time and browse around the shop. It is recommended that you visit the market on a Sunday as that way you can also take the opportunity to chill on the beach, visit the local bars and enjoy the local music artists in the evening while watching the sunset.